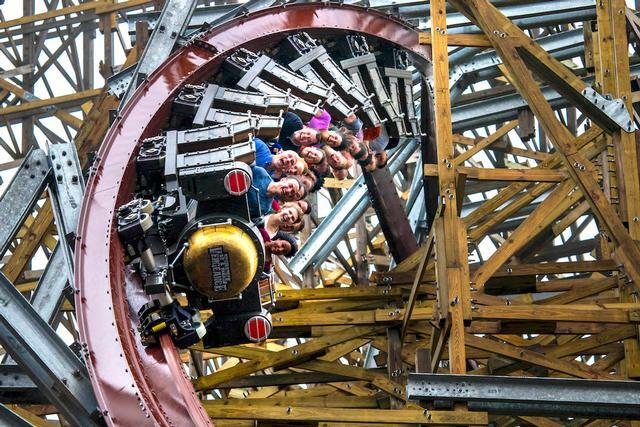 Steel Vengeance is an excellent roller coaster in Frontiertown and one of the best attractions at Cedar Point. The minimum height to ride is 52 inches. Mean Streak will become Steel Vengeance in 2018. The first hyper hybrid coaster will be 205 feet tall and feature four inversions and a 90 degree drop. This is the mother of all coasters! It delivers on all fronts. Thrilling in the extreme. So much airtime, it's basically a stand-up coaster. It isn’t the most intense ride I’ve personally rode, but it is one of the best. It’s got one of my favorite drops on any coaster that I rode and that’s not even the highlight for me. My favorite part is the third bunny hill at the very end as it has a a ton of airtime. I also do believe it does have 27 seconds of airtime. It is also the smoothest coaster I’ve ever rode. It ranks in my top four coasters. Highly recommend it. I wish the lines weren't so long so I could enjoy a second run on this coaster, but from my single ride in the back row, it had all of the characteristics of the RMCs just amplified to 11. The highlight for me was the outward banked turn just prior to the first inline twist. However, I felt that once we reached the MCBR the second half of the ride was like a truncated second act of a mediocre musical that was insufficient to make it a top coaster for me. The second half of the ride, while not lacking in intensity, excitement, and speed, just seemed to be a lesser version compared to the first half, and doesn't really add anything to the overall experience. Perhaps my opinion would be altered if the park could actually execute 3-train operations to warrant the extra length keeping lines manageable and moving, but I thought that the second half was literally like a "shake down" trying to remove every last piece of pocket change from your pants. There was no real memorable moment over the second half of the course, which to me is a disservice to the coaster as a whole. Every truly great coaster has a moment at or near the end that validates the length of the ride, whether it be a headchopper, tunnel, last surprise shot of air, or unexpected inversion. Steel Vengeance just continues to bounce and shake you in seemingly random and unremarkable ways (compared to the first half). RMC needed to include some type of "wow" moment after the MCBR to make it a top 5 coaster in my book. Don't get me wrong. This coaster is definitely worth planning a trip around, but it's not the pinnacle of coaster design, mostly attributable to the uninspired second half. It's almost like RMC realized they still had tons of energy and speed to burn off, but ran out of ideas of how to use it. They ended up with a repetitive burn-off of speed through endless pops of air and sweeping back and forths in the lower levels of the coaster's structure. Probably the most intense coaster in the world while being smooth. The most fun (and insane) coaster I've ridden. It sets a new standard for coasters. Out of the 212 coasters I've ridden, this is my #1 coaster by a huge margin. It leaves all other coasters in the dust.